The Cleaning Concierge is a bespoke cleaning services company in Kilkenny and a division of the award-winning McCreery Contract Cleaning business, in response to growing demands for reliable, trust-worthy and dedicated home cleaning services from time-poor professionals who would prefer to dedicate their free-time to their families, friends and leisure. New World Digital were engaged as a website design agency to create an engaging and informative website that conveyed the company’s core philosophy of professionalism and integrity. 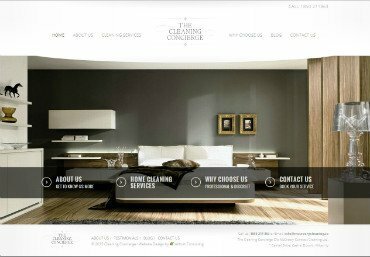 The Cleaning Concierge also wished for a range of functionality options which would enhance the visitor experience as well as making it easier for prospective clients to navigate and get in contact with the firm. Beginning by liaising with the client on how they wished their new website design to look and feel, our Website Design Consultant Michal created a series of mock-ups to identify the client’s favoured visual elements. Once this was signed-off we proceeded to develop the website with the bespoke functionality requested. Chief among this was the user-friendly CMS (Content Management System) which would allow for great flexibility and control by the client and make it very easy to make changes and add pages and content to their site as the company grew in the future. A newsletter signup was integrated with an extensive company database to aid the client in identifying core markets and areas for email marketing and expansion.